Adult Traditional Necklaces There are 30 products. 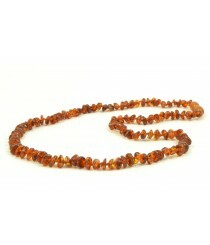 In our store we offer a huge selection of Amber necklaces for Adults. At the moment there is about 80 unique designs available that differ either in style or color. You can choose from styles like baroque, unpolished baroque, bean (olive), unpolished bean (olive) and combination of them. When it comes to colors you can choose necklaces that include cognac, lemon, dark green, milky, green and other color beads. The standard length of these adult accessories is 45 centimeters, which equals to about 18 inches. 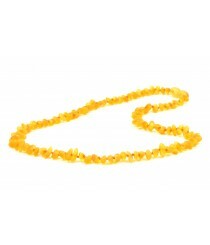 Based on your requirements we can also make these necklaces either longer or shorter. 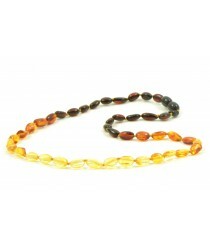 All of our necklaces for adults are made only from Amber that originates from Baltic Sea. Baltic Amber in particular is known to be the most beneficial for health since it contains the highest quantities of Succinic Acid. 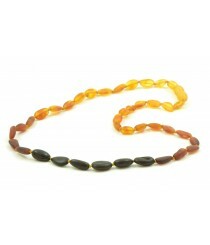 Potential benefits of wearing Baltic Amber necklace are minimization of pain & anxiety, stimulation of thyroid function, lessening of fatigue and other benefits. 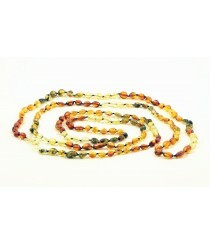 - Please note that Minimum Wholesale Quantity for any style and color Adult Necklaces is 5 pieces. - If you want to buy Amber Adult necklaces from us or you want to get our catalog with prices e-mail us to info@thenaturalamber.com or leave a message in our chat. We will send them to you shortly. 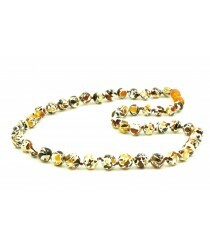 Product ID: A33-1O; Short Description: Long Multicolor Olive (Bean) Necklace, Minimum Order: At least 5 Necklaces; Color: Multi; Average Necklace Weight: ~26 g; String: 100% Poliester Cord; Clasp: Screw (Plastic) Clasp; Amber Beads: Polished; Other Features: Amber Beads are knotted from both sides; Style: Olive; Length: ~150 cm (59 inches).